Ethics is a very messy subject. Every person (except sociopaths) have a sense of what should or should not be done. As I was reflecting on how complex this whole idea is I realized there are basically two major axis or gradients that intersect. That of Everyone to No one and Always and Never. Now this is a very simplified version. There is always also a place that things happen at. And within that place various times. However, for the sake of greater understanding I decided to draw it out. As you pull back you can see more clearly what belongs to which categories. What is sad is that I can think of more things that belong in the upper right corner and bottom left corner than in the upper left or bottom right. Which is not to say that is necessarily the case. My suspicion is that it is actually the inverse, but because we live an imperfect world we tend to more easily and readily identify the bad. 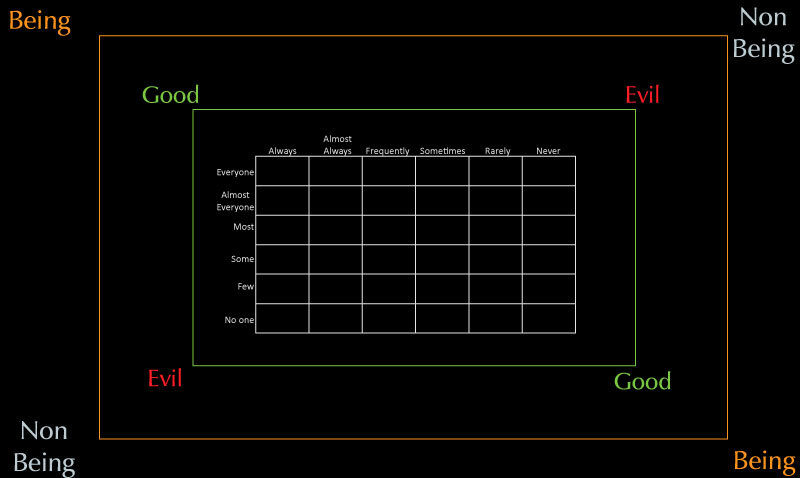 What is good or evil? Do they actually exist in reality? Let’s pull back again. 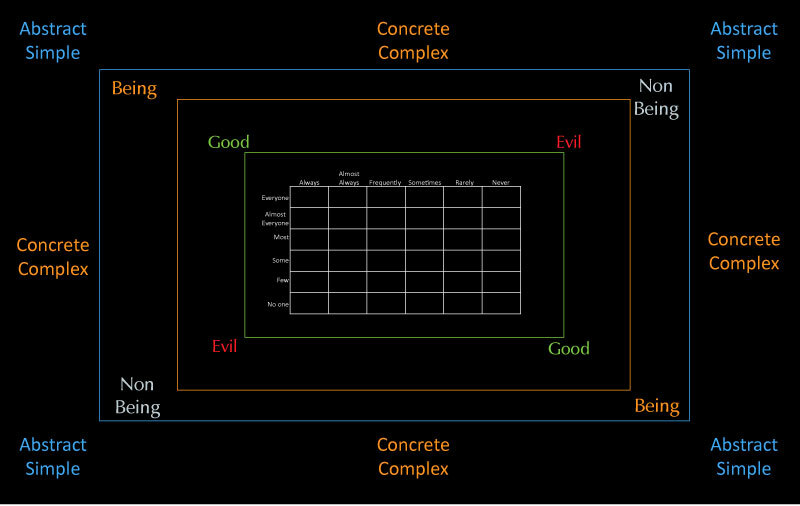 I don’t know of anything that is /pure/ goodness (re:perfect), but I definitely can’t think of anything that is actually evil either. Some philosophers conclude that evil doesn’t actually exist. Instead evil is seen as non-being. At the same time, the more being something has the more good it has. Thus goodness is positively correlated to to being. There is another dimension I would like to include which is that of how we understand things. It’s all well and good to talk about ethics in this fashion, but is it actually helpful? The more “pure” something gets the more abstract and simple it gets. The more “messy” something gets the more complex and concrete. For the most part we live in the direct middle of these images. The conclusion I draw from this is not that we should stagnate there or resign to a life of ambiguity. 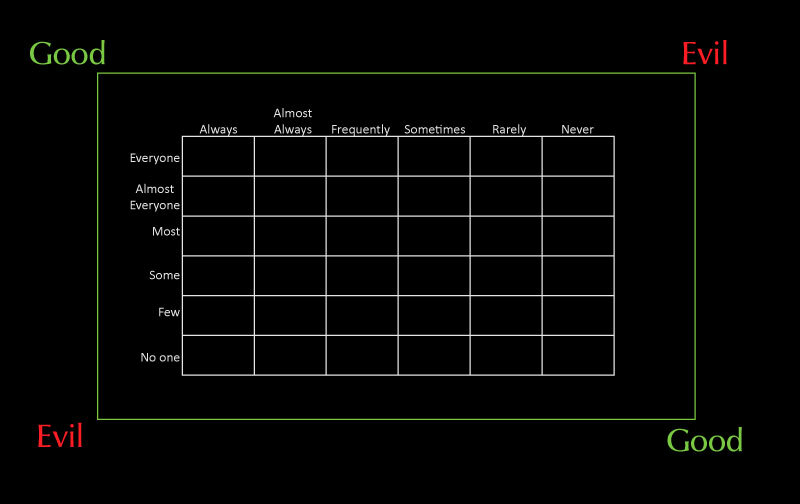 On the contrary I want to shift towards the upper left and bottom right in my behavior. I personally want to live on the positive outliers of the ethical spectrum. 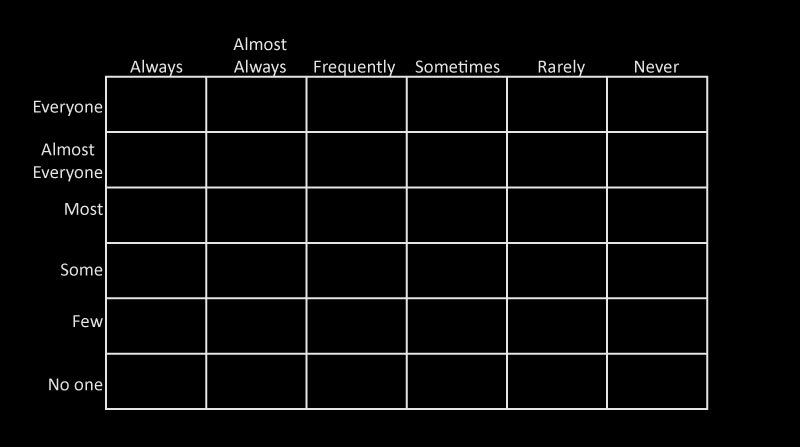 The better I understand what behaviors specifically fit in what categories the better I can do that. This paradigm I believe does not just apply to behavior and ethics, but the metaphysics (meta = beyond) that underlay it. The very of nature of things. For example all plants should always have mostly plant cells that’s how we know they are plants. They don’t due to infections, parasites and diseases, but that is precisely why those things are considered a bad thing.